The decades around 1600 saw one of the most exciting episodes in music history. It was the time of the monody - solos for a voice with basso continuo - and of the emergence of opera. It was also a time of increasing instrumental virtuosity and of experiments in text expression and harmony. Two styles coexisted: the stile antico which was dominated by counterpoint, and the stile nuovo in which one or several solo voices were expected to stir the emotion of the listeners. Not every composer felt the need to experiment and this goes to explains the differentiated picture of music life at the time. It is notable that some Italian composers of aristocratic birth who were dilettanti in their capacity as composers, were among the most experimental. That could be explained by the fact that they were financially independent and didn't need to take any position at a court or in a church. This disc is devoted to one of them, Giulio San Pietro De' Negri whom Marco Horvat, in his introduction in the booklet, compares with Bellerofonte Castaldi, another aristocrat and independent mind in musical matters. Le Poème Harmonique, Il Furioso (review) and Evangelina Mascardi (review) have recorded selections from his oeuvre. "Like Bellerofonte, Giulio San Pietro is a free spirit, curious, open to innovation and, above all, at liberty to wander as he pleases in this New World of sound explored by the Venetian master (Monteverdi)". He also mentions Carlo Gesualdo, again an aristocrat who was in a position to follow his own path, albeit different from those taken by Monteverdi and Negri. According to New Grove Negri was born in Milan and spent most of his life there. However, the title-pages of some of his collections call him 'gentleman of Genoa'. In his liner-notes Robert L. Kendrick writes that he was born in Puglia in the region of Salento, in the south-east of Italy, but grew up and had his first musical experiences in Lecce, in the same region. Several editions are dedicated to people from this area. In around 1608 he must have been in and around Genoa, and spent some time in Pavia and Milan. It is not known when exactly he died; no trace of his existence has been found after his last extant publication of 1620. It has been suggested that he may have been a victim of the plague in Lecce in 1629/30. He seems to have published at least eleven collections of vocal music; six of these have been preserved. The first two date from 1607 and include canzonettas for three voices. This scoring reflects the stile antico of the 16th century. These pieces were aimed at noble and amateur circles in Lecce. Two pieces from these two books are included here: Movea dolce un Zefiretto and S'en gia cantando. Although they are for three voices, in these performances instruments are also involved which seems to be legitimate as the mixture of voices and instruments was quite common at the time. 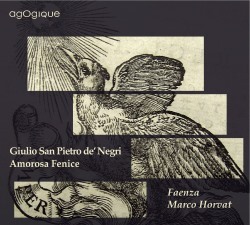 However, most pieces on this disc are from the next three publications, the Grazie ed affetti di musica moderna of 1613 and the second book with the same title of 1614 as well as Negri's last extant collection, Canti accademici concertati of 1620. These books document the change in style as they are dominated by monodies for one or several solo voices and basso continuo. Here we find specimens of San Pietro's experiments with text expression and harmony. Some of these are through-composed (Quel neo, Langue e spira), others are stropic, such as Filli perche m'uccidi. In these collections we find also some dialogues between mythological characters. Cantiamo, o Clori is a dialogue between Thyrsis and Chloris, whereas in Dimmi Pastor the characters are Chloris and Aminta. There are many examples of text expression, and Negri often uses harmony to depict the emotions which the text appears to want to express, such as Tu vai? Tu fuggi? or Ah, troppo sei crudele. Chromaticism is also used, for instance in the above-mentioned duet Dimmi, pastor dolente. In Ride o piange the word-pair "ben mio" is repeated many times, underlining their importance. The programme is rounded off with pieces by some of Negri's contemporaries. One of them is Giovanni Ghizzolo; he was from Brescia, was a Franciscan friar and worked in various places, including Ravenna, Padua and Novara. In Oimè, se tanto amate he uses the same procedure as San Pietro in Ride o piange: the opening word is sung nine times; the piece also ends with it. Ghizzolo is hardly-known, and that also is the case with Ottavio Valera, who - unlike Ghizzolo - has no entry in New Grove. He must have been a virtuosic singer, as the range of Sfogava con le stelle requires a voice which can sing in both the tenor and the bass range. Emmanuel Vistorky goes into his falsetto register once, but it is questionable whether that was intended by the composer. I would like to refer here to a disc by David Thomas (Musica Oscura, 1996) in which he sings pieces for such a tessitura by Giovanni Puliaschi without using his falsetto. This is a remarkable disc, the first ever devoted to Negri; Kendrick states that he could only find three pieces by him on disc up to 2012. That makes this production an important addition to the catalogue, whatever the quality of the performances. There is certainly much to enjoy here: first of all the music, and also a number of performances. One of the best is Langue e spira, brilliantly sung by Jeffrey Thompson. It is a shame that some pieces are spoilt by the incessant vibrato of Olga Pitarch. It makes Ghizzolo's Oimè, se tanto amato hard to enjoy, but is particularly damaging in the pieces for two, three or four voices. I don't understand why Marco Horvat allowed this to happen. It is a serious blot on the production.